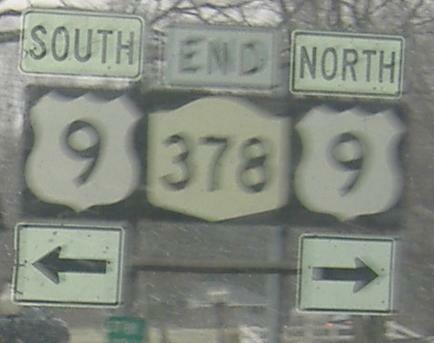 Westbound at the end of 378. 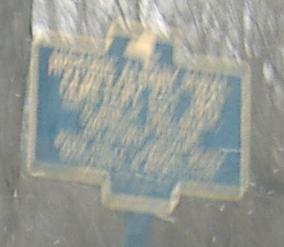 As you can see, it was snowing when I took this route, so apologies for blurry photos. 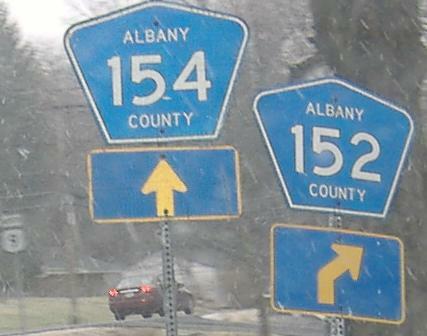 Albany loves its three-digit county route shields, and has for many years. Through the snow, an old-font 377 shield, and Historic Albany Royal Cemetery, established 1841, both westbound. 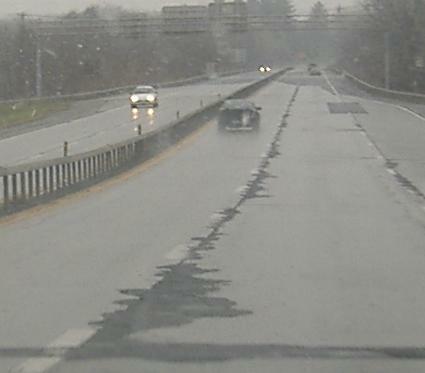 Terrible pavement on the short freeway linking NY 378 to the Troy-Menands Bridge, still westbound. 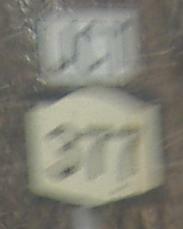 The freeway appears to overlay the original Bridge Road, while Menands Road continues to end at NY 32. The concrete underneath this is definitely original to the freeway/expressway construction, and it definitely was overlaid only once and many years ago. Looking up at the Troy-Menands Bridge from Water St. on the Troy side. Water St. was the original road down to the waterfront here, and may or may not have had a ferry across the Hudson River at some point. A bridge shot from the I-787 NB loop ramp to NY 378 WB. 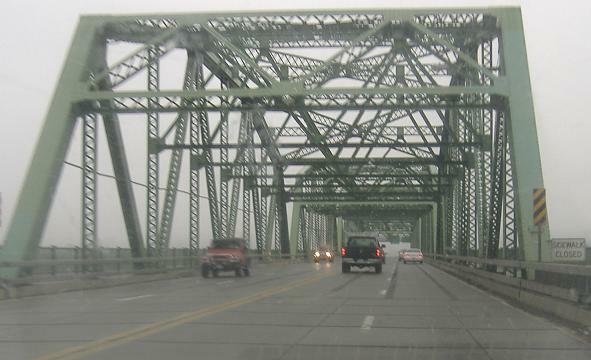 Westbound across that boxy bridge. Concrete railing on the WB side of High St., the name of NY 378 in Troy (and an apt name, since it climbs a hill to get to the beginning of the bridge). 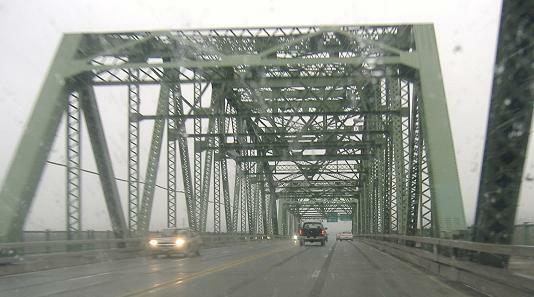 The bridge dates to 1959, and was originally a lift bridge - now that the lift towers are gone, there's nary a surgical scar! Looking toward the eastern end of NY 378 at US 4 from the gated Water St., which now leads to nothing special except a couple of industrial properties. 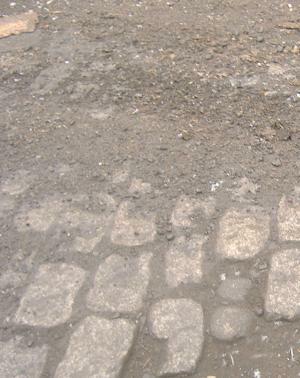 Water St. is so old, underneath the asphalt are cobblestones. Yet another generation of pavement, concrete pokes out from underneath the asphalt, reinforcing my hunch that Water St. led to a ferry once. Water St. turns hard left here and becomes River Rd. here. There's a No U-Turn sign, but I don't think it's warranted given how few people would come down here in the first place.